Unleash your iPod touch and take it to the limit using secret tips and techniques. 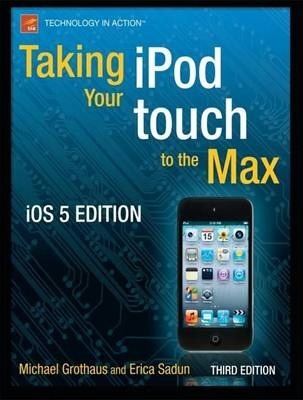 Fast and fun to read, Taking Your iPod touch 5 to the Max will help you get the most out of iOS 5 on your iPod touch. You'll find all the best undocumented tricks, as well as the most efficient and enjoyable introduction to the iPod touch available. Starting with the basics, you'll quickly move on to discover the iPod touch's hidden potential, like how to connect to a TV and get contract-free VoIP. From e-mail and surfing the Web, to using iTunes, iBooks, games, photos, ripping DVDs and getting free VoIP with Skype or FaceTime-whether you have a new iPod touch, or an older iPod touch with iOS 5, you'll find it all in this book. You'll even learn tips on where to get the best and cheapest iPod touch accessories. Get ready to take iPod touch to the max! Illustrations note XVI, 476 p.
Michael Grothaus is an American novelist and journalist living in London. He was first introduced to Apple computers in film school and went on to use them for years to create award-winning films. After discovering many of Hollywood s dirty little secrets while working for 20th Century Fox, he left and spent five years with Apple as a consultant. Since then, he s moved to Europe and written his first novel. Currently, Michael is a staff writer for AOL's popular tech news site TUAW.com, where he regularly interviews tech CEOs and writes about all things Mac. He is also the coauthor of Apress Taking Your iPad to the Max and Taking Your iPod touch to the Max, Second Edition. When not writing, he spends his time traveling Europe, northern Africa, and Asia. Epiphany Jones, a novel about trafficking and America s addiction to celebrity, is his latest book. You can contact him at MichaelGrothaus.com.